Pick 1: This comic from Mazie Lovie, published on The Nib, asks “Who Deserves a Home?” and my answer is: literally everyone. Housing should be considered a human right and homelessness should scarcely exist, yet in our modern world, it is a huge problem – one that in the United States is often used to blame people for their circumstances. This comic does a great job of dispelling some of the myths around home ownership and is particularly powerful at a time when the homeless are being, once again, weaponized to argue against accepting refugees and other immigrants. All of this is relevant to health, but it is particularly important to recognize that homelessness itself is not only a cause of many health problems, an effect of others, but is an impediment to treatment in ways that most practicing healthcare workers have themselves NEVER experienced. Pick 2: As I do with most conferences, I am not capturing them in the Tweets below because there are simply too many. So, I highly – HIGHLY – encourage you to go read through the #ConMedicinaGráfica feed. The photos on Instagram have been wonderful as well! A huge, heartfelt congratulations to the entire Medicina Grafica team for what looks like an amazing conference! It looks like you can watch a good deal of the conference on this YouTube live-stream! I’ll update here if something changes with this link. Scholarly: Discrepant Analysis and Bias: a Micro-Comic Strip. Please note that I am making a point to only share Best of Lists that explicitly include titles relevant to graphic medicine. There are hundreds of these every year, so I’ll likely miss plenty. I do not endorse ANY of them – “best” is a difficult term for our field. 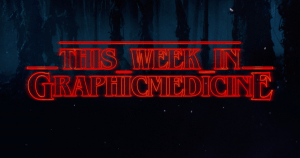 Join our email list to keep up with the latest Graphic Medicine news! Graphic Medicine is a site that explores the interaction between the medium of comics and the discourse of healthcare. We are a community of academics, health carers, authors, artists, and fans of comics and medicine.